to play and get involved with our afternoon mini- leagues. 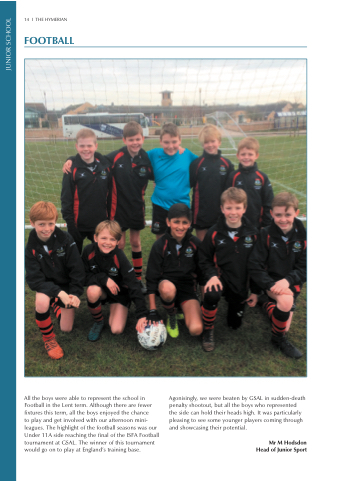 The highlight of the football seasons was our Under 11A side reaching the final of the ISFA Football tournament at GSAL. The winner of this tournament would go on to play at England’s training base. Agonisingly, we were beaten by GSAL in sudden-death penalty shootout, but all the boys who represented the side can hold their heads high. It was particularly pleasing to see some younger players coming through and showcasing their potential.